Market garden quality. 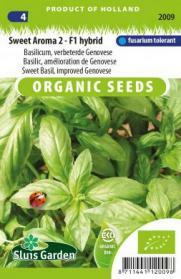 Sweet Aroma F1 is fusarium tolerant and is regarded as a very reliable Genovese basil. Has a very intense flavour and a wonderful aroma for the most delicious pesto. Sow in a greenhouse. Do not cover the seeds. Press them gently and keep moist. Once the plants are large enough, transplant into pots and boxes, or in a warm spot in the garden. Tasty in salads, pastas, pesto, etc.